Geauga Lake in the Cleveland Ohio suburb of Aurora opened in 1887. It was a good sized park that grew with the times. In the 1970's with the theme park book Geauga lake opened the first coaster with two consecutive loops named the Double Loop. In the mid-1990's Premiere Parks acquires Geauga Lake and further developing the park with several more coasters. Premiere Parks took over Six Flags and in 2000 $40 million was invested in what was to become Six Flags Ohio. A record three coasters were added that year as well as a considerable facelift of the park. In 2002 the park changed again when Six Flags acquired the SeaWorld Ohio property across that sat on the opposite shore of Geauga Lake making one of the largest amusement parks in the country. Unfortunately with Premiere Parks/Six Flags park buying spree came debt which led Six Flags to sell off Geauga Lake to the nearby competing Cedar Point. 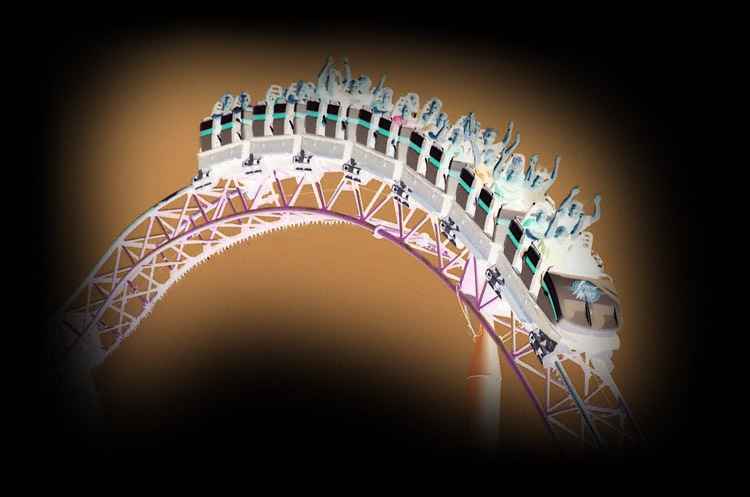 The park was not marketed well under Cedar Point and in 2007 the park saw the last guests pass through the gates and the last rides on their coasters including the legendary Big Dipper that was designed by classic coaster designer John Miller. Since then the park has been stripped of rides, several including the Double Loop and Villain were cut up and sold for scrap. As of right now in 2015 all that remains is a bunch of land that Cedar Point can't seem to sell, the SeaWorld half has been turned into a water park, collapsing buildings and the sad remains of Geauga Lake's oldest ride; the Big Dipper standing silent over a place that was once full of laughter and life. While I don't like it when a park closes I like to remember it in life with all of the good times I had there. Click on the links below to see the trip reports from those years.